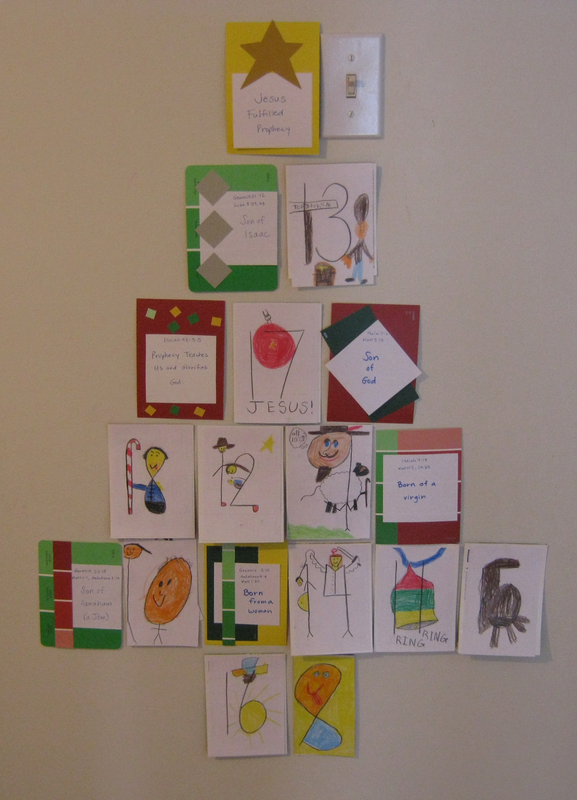 This is a picture of our Advent calendar. I had our two boys help me to make it (can you tell?). I thought they’d love helping to make the calendar. I thought they’d love having an advent calendar to mark off the days until Christmas. We’ve always done some sort of activity over Advent. It’s part of our family tradition. I thought they’d look forward to the activity. Unfortunately, it didn’t exactly work out that way. Are we the only ones, or has that ever happened to you? It was a week before December, and I still hadn’t gotten my act together to make up the advent calendar I wanted to do this Christmas season. I’d chosen the Prophecy Advent Calendar I blogged about a few weeks ago, because I wanted to introduce to our kids the idea of prophecy and how Jesus’s birth fulfilled prophecy. On Wednesday of the week before December, we had a snow day. I had the great idea (so I thought) of having our kids help me to make up the calendar since they wouldn’t be at school. I thought they’d love to help out, and that it would give them a sense of ownership over the activity. But when it was all complete and hung on the wall, they were quite proud of their accomplishment, and were interested in doing it. However, until a few days ago, it hung on the wall completely untouched. Now, I purposefully picked a calendar that had fewer than 25 days to it, because we always end up being a bit behind in these things. But this was the most behind we’ve ever been. When we finally had the chance to schedule the activity in after dinner, I decided we should do several of the cards, just to try to catch up. But the kids were squirrelly that evening. They kept wandering off, or reaching for other toys, or giving silly answers, or complaining that they had nothing to ‘do’ while we were doing the calendar. I have to admit, I was frustrated. It was tempting to force them to sit and listen. But that would have just made things worse. I was letting my sense of urgency (the need to catch up!) drive the agenda. Getting the calendar done before Christmas was not the most important thing in the world. Worst case scenario, we’d finish it after Christmas. Or never, but at least they’d get some of the idea of Biblical prophecy into their heads. So, I cut the activity short, let the kids have a bit of being silly time since that’s all they were in the mood for, and then we got them ready for bed. Perhaps your family is like ours. Do some of your best efforts to teach your kids backfire as well? Sometimes the mood isn’t right. Kids’ moods can’t be allowed to dominate the family agenda, but sometimes a bit of creativity can help bring them around. This whole experience emphasized to us the need to work with where our kids are at when teaching them about our faith. Sometimes it’s timing, sometimes it’s the way the lesson is presented, sometimes it’s both. If we let our own timing drive the agenda and plow through the lesson, it probably won’t stick. It we make it too much like a school lesson, Christianity might become boring. This is something we all want to avoid! And whatever you do, don’t let your own kids discourage you from passing on your faith to them! Don’t give in to the idea that “This just doesn’t work for our family”. Find a way that works, regardless of successes and failures, regardless of whether or not things go exactly as planned, regardless of the messiness of parenting, regardless of other demands. Passing on your faith is the most important job you have as a parent. Please don’t give it up! Yes, having a devotional time as part of the dinner hour always worked best for us. First course, then devotional, then maybe dessert. And this pattern still works best, even though it is now grandchildren around the table on occasion. Perish the thought of it being bribery! Dessert is an added blessing or reward.